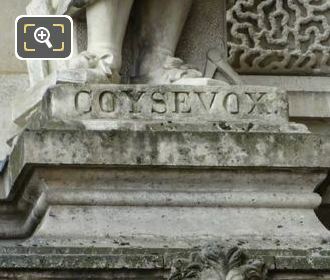 We were again within the Cour Napoleon of the Musee du Louvre, which is located in the 1st Arrondissement of Paris, when we took these high definition photos showing the statue of Antoine Coysevox, sculpted by Jules Antoine Droz. 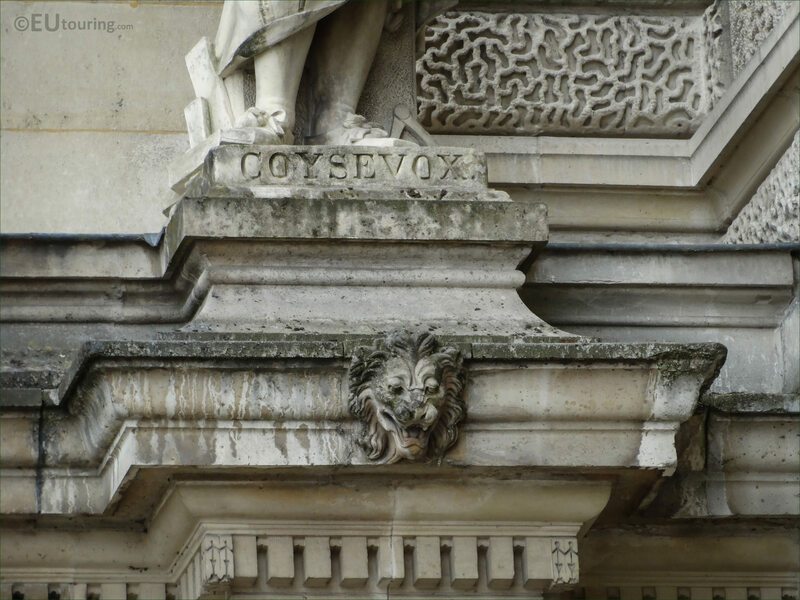 This first HD photo shows the stone statue of Coysevox, which is located on the first level of the Aile Henri II wing, and as you can see this is located at the very end of the facade to the right hand side, next to where the former Palais du Louvre returns as it goes round the courtyard and meets the Rotonde d'Apollon. In this photo you can see the base of the statue bearing the name of this famous man in french history, and this was sculpted by Jules Antoine Droz who was born in Paris on 12th March 1804. And becoming a French sculptor he entered the Ecole des Beaux Arts in 1820 and presenting his works at different Paris Salons, he then received commissions for The Louvre Museum prior to passing away in Paris in 1872. Now this last close up photo of the statue is depicting Charles Antoine Coysevox, who was born in Lyon on 29th September 1640, and also became a French sculptor, which is why he has been depicted holding a small statue. 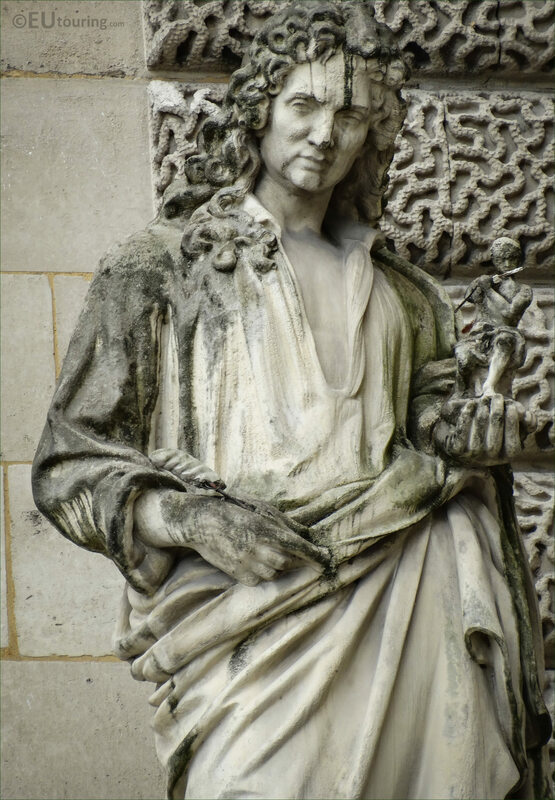 And Antoine Coysevox was commissioned to produce numerous statues for places such as the facade of the royal chapel at Les Invalides, for the grounds of the Chateau Marly, which was demolished in the French Revolution, etc and many of these can still be seen today in places such as the Louvre Museum, along with the equestrian Pegasus statues in the Tuileries. 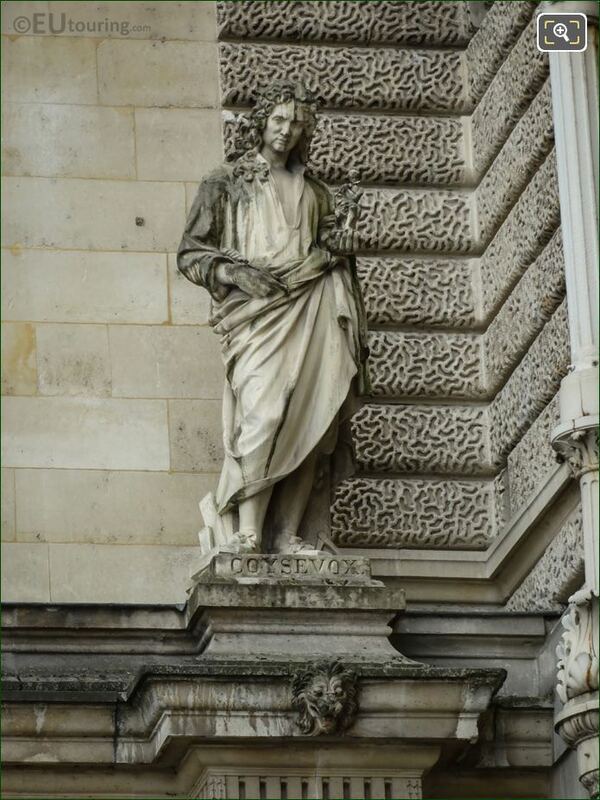 Yet he was also renowned for his busts of famous people that he sculpted with such realism and likeness, and he produced these for people such as King Louis XIV, King Louis XV, Mazarin, Andre Le Notre and many others, plus he produced several funerary monuments all before passing away in Paris on 10th October 1720.